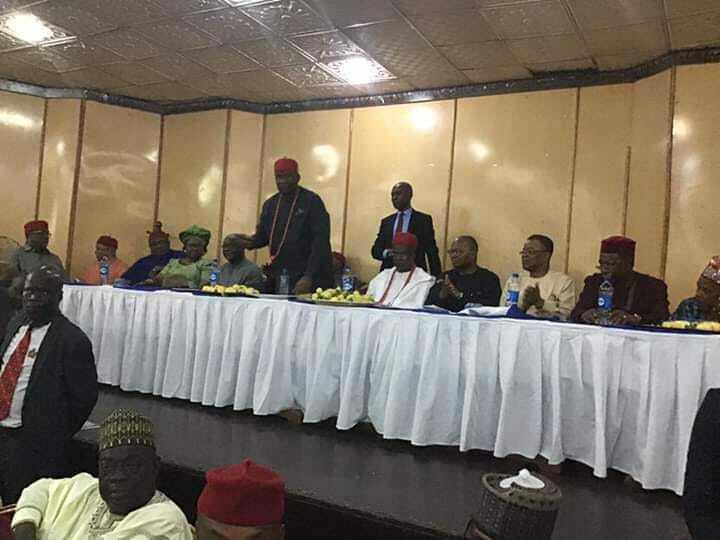 Igbo leaders comprising elders, traditional and religious leaders as well as women groups, yesterday endorsed the joint presidential ticket of Alhaji Atiku Abubakar and Mr. Peter Obi. In a five-point communique issued at the end of the summit with the theme “Ndigbo 2019 and Beyond” held in Enugu, the Igbo leaders said that the decision was based on the restructuring agenda put on the table by Atiku/Obi, which four zones of the country had agreed on. The communique read by a legal luminary, Olisa Agbakoba, SAN said: “The Igbo people of Nigeria held a 1 day non-partisan and inclusive Summit convened by Elders, Traditional and Religious leaders on Wednesday 14thNovember 2018 to consider Ndigbo’s place in the polity especially in light of the forthcoming 2019 elections. “The summit deliberated on the State of Ndigbo in Nigeria today especially after years of exclusion from the center. This country has never been so divided as it is today. We Igbos have always yearned for a level playing field with justice, equity and fairness. “The Summit recognized the nomination of His Excellency Mr. Peter Obi Former Governor of Anambra State as the Vice Presidential Candidate of the PDP and fully endorses this nomination. It was acknowledged that this nomination puts Ndigbo back in the center of governance. It is therefore important that Ndigbo should rally behind the Atiku/Obi ticket. “We identify with the Atiku/Peter Obi ticket on the restructuring agenda as has been reiterated by 4 zones of the country namely: South South, South West, North Central and South East. We believe that as long as the federating units remain weak the center will continue to be weak. We equally move to appreciate the position of the Atiku/Obi ticket in promoting national unity. In welcoming the Presidential flag-bearer to the Summit, the Chairman of Ohaneze Worldwide, Chief Nnia Nwodo, thanked him for the choice of Obi as his running mate. He assured him that Obi was one of the best in Igboland who redefined governance in Nigeria through his seminal achievements as Governor of Anambra State by moving the state from the worst to the best in education, health, road construction and other sectors. Atiku, who was accompanied by the National Chairman of the PDP, Chief Uche Secundus and other PDP big wigs such as Sen. Bukola Saraki, Aliyu Babangida, Ben Bruce, Gbenga Daniel, Tom Ikimi, and Dino Melaye, assured the Igbos that he would work towards their demands, which were already in his policy paper. He later paid a courtesy visit to the Governor of Enugu State, Hon. Ifeanyi Ugwuanyi, before departing. Who is who in Igboland attended the event, some of whom are Theodore Orji, Azubuike Ihejirika, Mao Ohuabunwa, Ben Obi, Obi Alfred Achebe, Emmanuel Iwuanyanwu, Okwy Nwodo, Emeka Ihedioha, Ebitu Ukiwe, Obi Umahi, Ben Nwabueze, Guy Ikoku, ABC Nwosu, Vincent Ogbulafor, Adolphus Wabara, Frank Ogbuewu, Ike Nwachukwu, Uche Azikiwe, Osita Chidioka, Onyema Ugochukwu, Achike Udenwa, Walter Ofonagoro, Ndubisi Nwobu, Obiora Okonkwo, and Archbishop Maxwell Anikwenwa.